Kevin Durant scored 14 of his game-high 32 points in a second-quarter run-away on Friday night, as the Golden State Warriors snapped a four-game losing streak with a 125-97 victory over the Portland Trail Blazers in Oakland, Calif.
Klay Thompson was right behind with 31 points as the Warriors, who shot 56.5 percent overall and 53.1 percent on 3-pointers, beat the Trail Blazers for the eighth consecutive time at home. 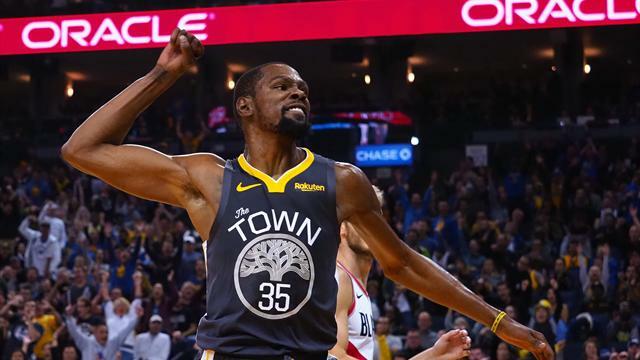 Durant had a 3-pointer and a three-point play among his 14 points in what turned out to be a 35-11 burst that produced a 59-40 lead late in the half. The Warriors went on to lead by as many as 22 points in the third period before coasting home. Jamal Crawford connected on a free-throw line jumper with 0.8 seconds left to give Phoenix a victory over Milwaukee for their first road win of the season in nine attempts. Crawford's clutch basket capped a game-ending 8-0 run for the Suns, who snapped a three-game overall losing streak. Devin Booker registered 29 points and seven assists as one of seven Phoenix players in double digits. Giannis Antetokounmpo scored 35 points on 14-of-16 shooting and collected 10 rebounds for the Bucks, who had a three-game winning streak halted. Brandon Ingram scored 24 points, and LeBron James added 22 points and 10 rebounds as Los Angeles defeated visiting Utah to win its third straight game. The Lakers led 79-76 with 5:28 to play before grabbing momentum with a 9-3 run over the ensuing four minutes and taking an 88-79 advantage down the stretch. A bucket and two free throws from the Jazz's Alec Burks cut the lead to 88-83. Ingram canned a pair of free throws with 19.7 seconds to play to cement the win. The Lakers (11-7) have won seven of their past eight outings. Reggie Jackson scored 10 points in overtime, Blake Griffin supplied 28 points for the game and host Detroit topped Houston. Jackson finished with 22 points and six assists. Griffin added nine rebounds and four assists and Andre Drummond powered for 23 points, 20 rebounds and five blocks. James Harden led the Rockets, who had a five-game winning streak snapped, with 33 points and eight assists. Clint Capela had a career-high 29 points and 21 rebounds and Chris Paul supplied 20 points and nine assists for Houston. Rodney Hood scored 25 points, and Tristan Thompson scored 18 points and grabbed 13 rebounds as visiting Cleveland defeated Philadelphia. Philadelphia went nearly five minutes midway through the fourth period without a field goal, and the Cavs took advantage. A Jordan Clarkson 27-foot jumper gave the Cavs a double-digit lead at 109-97, and Cleveland cruised to its first road win of the season. Philadelphia had its four-game winning streak snapped and lost for the first time at home this season. The Sixers had won 20 straight at Wells Fargo Center dating to last season. Russell Westbrook narrowly missed a triple-double with 30 points, 12 rebounds and eight assists, and Oklahoma City held on down the stretch for a victory over visiting Charlotte. Westbrook hit four free throws in the final 11.2 seconds, after the Hornets got within one point on two different occasions. The win was the Thunder's 12th in the last 14 games and came after a 28-point win at Golden State on Wednesday night. It also gave the Thunder (12-6) a season's sweep over the Hornets after they rallied from a 19-point deficit to win in Charlotte three weeks ago. Kawhi Leonard had 27 points and 10 rebounds, and Toronto pulled away for a victory against visiting Washington for its fourth straight win. Five other Raptors scored in double figures, led by Kyle Lowry and OG Anunoby, who finished with 15 points each. Toronto, owner of the NBA's best record (16-4), shot 49.5 percent, including 43.6 percent (17 of 39) from 3-point range. Bradley Beal led the Wizards with 20 points. John Wall had 11 points and 11 assists but turned the ball over seven times, as Washington was unable to build on its stirring come-from-behind win over the Clippers on Tuesday. Montrezl Harrell recorded 22 points and 11 rebounds off the bench, and Danilo Gallinari added 20 as Los Angeles rallied to earn a victory and end visiting Memphis' five-game winning streak. The Clippers trailed by eight points with two minutes remaining in regulation, capping their game-tying comeback when Gallinari made three free throws with 0.8 seconds remaining after he was fouled by Marc Gasol on a 3-point attempt. Gasol had 27 points and 13 rebounds while Mike Conley scored 19 points with 11 assists for the Grizzlies, who had just moved atop the Western Conference after a victory at San Antonio on Tuesday. Aron Baynes led six double-figure scorers with 16 points, and visiting Boston broke a three-game losing streak with a win over Atlanta. The loss was the 10th straight for the Hawks (3-16), who have the NBA's worst record and haven't won since Nov. 3. The Celtics (10-9) won in Atlanta for the third straight time. Baynes was 5 for 7 from the field and added nine rebounds and four assists. The Celtics also got double-digit scoring from Jayson Tatum (14), Kyrie Irving (13), Terry Rozier (12), Gordon Hayward (11) and Jaylen Brown (10). Marcus Smart had a team-high seven assists and three steals. LaMarcus Aldridge scored a game-high 33 points and added 14 rebounds for San Antonio, which never trailed in beating host Indiana. The Spurs snapped a two-game losing streak with just their third win in the last 10 games. The Pacers have lost two straight, both of which they have played without star Victor Oladipo, who is has missed three consecutive contests with a sore right knee. The double-double was the 11th of the season for Aldridge. Rudy Gay also had a double-double for the Spurs with 11 points and 12 rebounds. DeMar DeRozan (16 points), Patty Mills (15 points) and Bryn Forbes (13 points) also scored at least 10 points apiece for San Antonio. Trey Lyles scored a season-high 22 points off the bench, Nikola Jokic finished four points shy of a triple-double, and host Denver beat Orlando. Jamal Murray scored 16 points and Mason Plumlee had 15 points and 11 rebounds for the Nuggets (12-7). Terrence Ross led the Magic with 18 points and made his first seven shots - four from 3-point range - before missing. Nikola Vucevic had 16 points for Orlando (9-10). Derrick Rose scored 11 of his 25 points in the fourth quarter, while Karl Anthony-Towns shook off early foul trouble and scored 17 of his 21 points in the third as Minnesota picked up its first road win with a victory over Brooklyn. Rose led the Wolves in scoring for the fifth time and produced his eighth 20-point game by hitting 11 of 17 shots, including 5 of 7 in the fourth. Towns made 9 of 18 shots, while Taj Gibson added 16 and 11 rebounds. Jeff Teague contributed 15 points as the Wolves ended their season-opening eight-game road losing streak by shooting 47.8 percent. New York rallied from a late seven-point deficit by scoring 12 consecutive points, overtaking visiting New Orleans for the win. Emmanuel Mudiay scored 27 points, and rookie Allonzo Trier came off the bench to add a season-best 25 for the Knicks, who trailed 103-96 with 3:58 to go after two free throws by the Pelicans' Julius Randle. Mudiay got the New York flurry rolling with a 3-pointer, and capped it with a hoop with 34.1 seconds left that put the Knicks up five, 108-103. The Pelicans got within two on two subsequent occasions. But Mudiay made one free throw, and Tim Hardaway Jr. hit a pair to close out New York's second straight win after six consecutive losses. Josh Richardson scored 12 of his 27 points in the fourth quarter to lead Miami to a win over host Chicago. Justin Holiday led the Bulls with 27 points and 13 rebounds, both season highs. Zach LaVine added 24 points and a game-high nine assists for Chicago, which was trying to win two straight games for the first time this season. The Heat, who led by as many as 26 points in the second quarter, had their advantage cut to just four in the fourth. Jabari Parker scored 17 of his 23 points in that fourth as Chicago's offense caught fire. But Miami held on and snapped a three-game losing streak.